This pattern you can use everywhere. Baby knitt and the kids knitt or you can make a cardigan yourself. 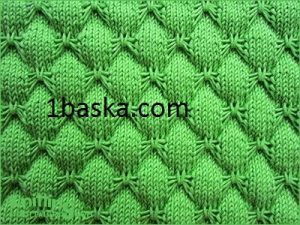 I like this pattern and it is very easy to knitt. This stitch is very beautiful, I have seen many different things and projects, clothes and accessories knitting with this exact stitch and they look awesome so I think that it’s time for you to learn how it’s done. The video tutorial and the pattern which I chose to share with you my dear friends are very popular. The feedback they have got are pretty impressive so that means said many knitting lover have already tested them and they work just fine. With the help of the tutorials you will knit this stitch very easy and very fast and the techniques that you will learn from this article you will remember forever. I also think that this stitch will be very used by many knitters, because when I imagine some thing knitted with the butterfly stitch I fall in love with my imagination so I think that there will be several project where I shall you it and my advise will be to do the same. So view the pattern or play the video tutorial and follow it’s steps, share the article with your friends to help them learn some new stitch and make their day more interesting and entertaining. When you finish knitting tell us about the impressions and the opinion you will get about the butterfly stitch. Enjoy the article. Knitted in a multiple of 10 + 9 sts and 20-row repeat. Rows 1, 3, 5 & 7 (Right side): K2, * sl 5 wyif, k5; rep from * to last 7 sts, sl 5 wyif, k2. Rows 11, 13, 15 and 17: K7, * sl 5 wyif, k5; rep from * to last 2 sts, k2. Row 19: K9, * k1 uls, knit 9; rep from * to end.